X-files and 30 Days of Night. When I first heard of this crossover it made me think, ‘why not?’ Why hadn’t this been done before? Well, I guess it was a matter of timing. X-files ended its run in May 2002 and the first 30 Days of Night mini-series came out later that year. X-files had lost a lot of steam towards the end so I guess doing a crossover with it at the time didn’t make much sense. But with the 2008 movie “X-files: I Want to Believe” and the comic series Wildstorm published that same year, X-files has had some exposure once again. 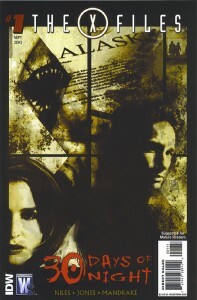 I love Steve Niles’ 30 Days of Night series but I was just a casual X-files fan. The show appealed to me more during the episodes that dealt with the alien conspiracy. So, I wasn’t sure what to expect with an X-files vampire story. But Niles has set up a great story that perfectly blends the two worlds. His collaboration with Adam Jones is flawless because I can’t see a discrepancy in the writing. It’s obvious already the two work well together. One of Niles’ strengths is that he knows how to write good characters. Even if they’re not essential players, sometimes he takes secondary characters and makes their role in the story more interesting than most writers usually do with secondary characters. Here, it’s a truck driver named Henry-Lee “Patches” Brown. His story bookends this first issue. He’s a native of Alaska so his inner monologue about life in the state really brings you into the mood of the story. Speaking of inner monologue, Niles does an excellent job of utilizing this to help us feel what Patches is feeling as we experience the story with him. This part made it feel like a comic but in contrast, the scenes where Mulder and Scully show up and begin their classic banter, it felt like an X-files episode. Niles blended the two perfectly here. And yes, I did imagine David Duchovny and Gillian Anderson voicing their parts which made it even more enjoyable. Tom Mandrake’s art is decent. I can’t say I was blown away by it but I did enjoy it. He got a chance to illustrate some really creepy scenes like Patches’ discovery of the murder scene at the beginning and at the end with a really gruesome cliffhanger. We’ve got the setup for a great story and I think fans of both series will find something they like here. I’m extremely curious to see how Mulder and Scully are going to handle such a dangerous opponent as vampires. But Niles has never let me down with his storytelling so he’s definitely got me hungry to know what’s coming next. This entry was posted in 2010, Creator Owned, Reviews, X-files/30 Days of Night and tagged 30 Days of Night, Ben Abernathy, kristy quinn, review, shannon eric denton, steve niles, tom mandrake, x-files, X-files/30 Days of Night. Bookmark the permalink.